The River Nith board have launched a new innovative idea for this season “Nith Sea Trout Experience”. This project is intended to give anglers a chance to fish the prime sea trout beats on the River Nith for no cost. The theory being, that if they enjoy the experience then they may return at a later date and purchase a ticket. In addition, whilst we heard from some anglers that the sea trout run was good during 2014 the Board and Trust would like to collate accurate data on fish captured against effort expended. To achieve this all participants would be requested to fill in an angling diary, provided by us following each fishing trip. 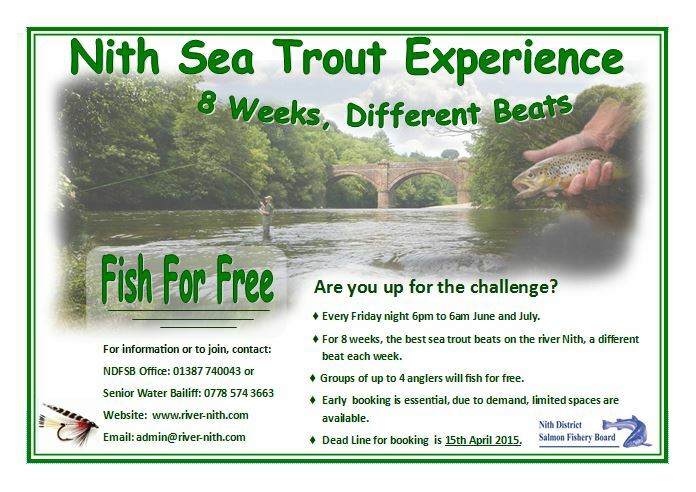 Fish for sea trout on the River Nith for free, every Friday night for 8 weeks on different beats.